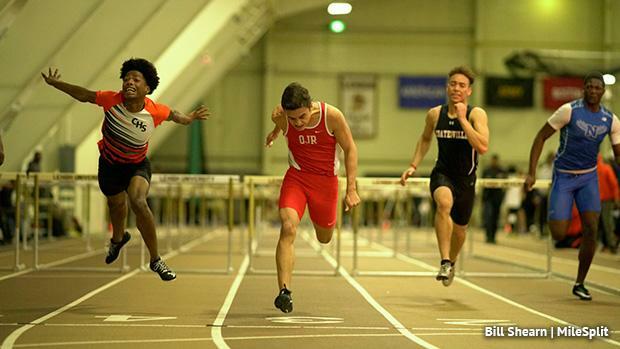 This indoor season will be seen as a largely transitional year in the boys' 60-meter hurdles. There's plenty of opportunities for new faces to rise to the top with 7 of the 8 finalists from last year's indoor state final have graduated. And it was a legendary season in 2017/18 the event with Ayden Owens capturing the national title in March and Kyle Garland also making the national final. This year, the top 11 returning times in the state come from current seniors and each will be looking to get their hands on a state medal and a shot at the overall state title. The top returner based on time is Scott Honicker of Owen J. Roberts. As a junior, Honicker dropped a strong 8.12 to win the TFCAofGP Meet of Champs. He'll look for another big season in the event after last year's breakthrough. State College Area's Chase Longenecker is the lone returner from the state meet final. He grabbed sixth in that ultra-competitive race, runnign 8.30. He bettered that to 8.28 at indoor nationals and should be a threat for the state title indoors after an outdoor season that also saw him take sixth at outdoor states in AAA. Among the returning boys that made at least the semifinal at the state meet, outside of Honicker and Longenecker are Norristown's Ramir Wiggins, Waynesburg Central's Daniel Layton, Malvern Prep's Sebastian Costantini, and North Allegheny's Donovan Rice. Layton was an outdoor state medalist in AA. Rice has the fastest returning time of that bunch; he went 8.32 in the state meet prelims. West Chester East's Charlie Webb, Hempfield Area's Jared Bannon, North Penn's Curtis Young, and Neumann Goretti's Ronald Holmes (an outdoor state medalist in AA) will also look to compete for fast times this winter.